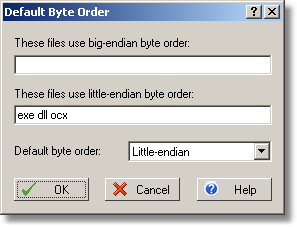 This dialog specifies the default byte order for most commonly used files. Enter the file extensions for which a specific byte order should be used. All other files will be opened using the default byte order. The extension-specific settings are used by Open and Save As commands only, that is the byte order will be set automatically only when you open a file, or save a file under a different name. The Save command does not change the current byte order settings.